Tuesday, Chevrolet announced that 2013 Sonic and Spark vehicles with Chevy's MyLink will be able to integrate with Siri more intelligently. Last summer, Apple announced Siri integration with automobiles and soon after GM announced that Sonic and Spark vehicles would have Siri enabled technology in early 2013. Well "early 2013" is now, and starting today, Siri-compatible iPhone users will be able to minimize distractions and use Siri sans hands and eyes. Included in this pairing is voice activated phone calls, media integration, listen to and send iMessage or texts to your contacts, access and add calendar appointments. No word yet on when Siri will be available on the rest of Chevy's line-up but it appears that Siri integration will be all the rage this year with many more car manufacturers on board like Hyundai and Acura/Honda on board for 2013. DETROIT – Today, 2013 Chevrolet Sonic and Spark vehicles with Chevrolet MyLink will be available with Siri, an intelligent assistant that helps get things done just by asking. "The Chevy Sonic and Spark are the first vehicles to offer Siri Eyes Free integration," said Cristi Landy, Chevrolet marketing director for small cars. "Safe, easy, reliable and portable connectivity is a top priority for our customers, and Siri complements MyLink's existing capabilities to help deliver an incredible driving experience." 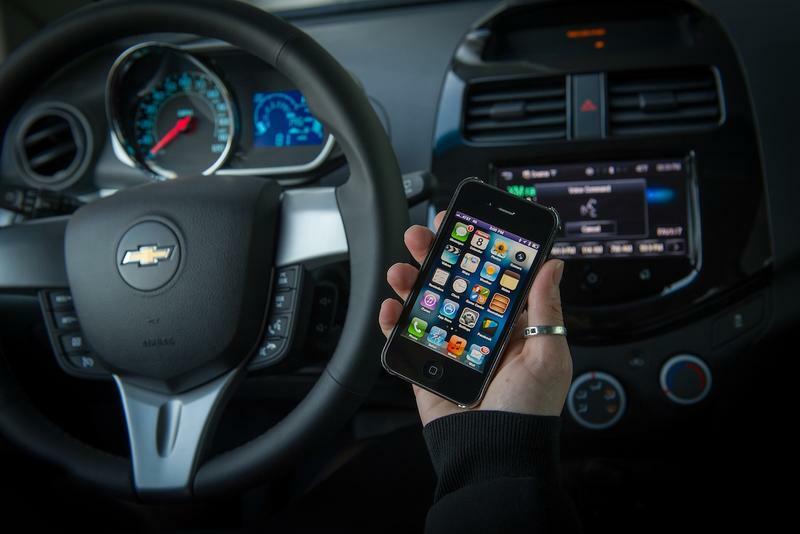 Through the cars' standard Chevrolet MyLink infotainment system, customers with a compatible iPhone* running iOS 6 can direct Siri to perform a number of tasks while they safely keep their eyes on the road and their hands on the wheel. To further minimize distraction, Siri takes hands-free functionality even further with an Eyes Free mode which enables drivers to interact with their iPhones using nothing more than their voice while keeping the device's screen from lighting up. Both the Spark and the Sonic also come with six months of OnStar's premium Directions and Connectionsservice. OnStar brings added safety, security and connectivity to these vehicles, including services such as Automatic Crash Response, Stolen Vehicle Assistance, Vehicle Diagnostics and Roadside Assistance. Current 2013 Chevrolet Spark and Sonic owners can upgrade existing MyLink radios for Siri capability beginning in March.